Thank you, God, for the gift of my son. Thank you, God, for his giggles when I squeeze his knee. Thank you, God, for his high-pitched “Weeeeeee” every time I lift him into the air. Thank you, God, for his tight melt-into-you hugs. Thank you, God, for the way his blue eyes twinkle with excitement when he goes outside to play. Thank you, God, for the adorable lilt of his voice when he reads. Thank you, God, for the way he sings Happy Birthday to himself, just because he feels like it. Thank you, God, for the way he says “mmmmmmm” the entire time he eats a chocolate donut. Thank you, God, for the way he congratulates himself whenever he completes a task. Thank you, God, for the way he names, then gives, every part of my face a little kiss before bed. Thank you, God, for the way he shows me how big the little things are. Bill Maher used the “R” word in a stand up comedy act in reference to Sarah Palin’s son, Trig. If there ever was a definition of a bully and a coward, that would be it right there. Bill, if you don’t like Sarah and her politics, fine, whatever. But to go after her child? I can not think of a reason or apology good enough for that. You seriously expect us to believe that, Barbara? You personally know better, yet you stand up for this bullying remark? What clearly happened in this situation, is politics was put above the value of Trig’s life. That fact makes me incredibly sad. People with this type of vocal platform, have used it to defend cowardly behavior rather than stand up for what is right. Whatever your beliefs about Sarah Palin’s politics are, she has made a positive impact in showing the world how Trig is an accepted and integral part of her family’s active life. Tragically, many parents terminate their pregnancies when they learn their child has Ds. This is due, in a large part, to lack of awareness of the quality of life of our kids have and the value and joy they bring to our families. When a mother is pregnant, or just has a baby, and the family is told their child has Ds, it is overwhelming. The prevailing thoughts are, What will our child’s quality of life be? How will this effect our family? Parents are desperately seeking out any sign of what life is like with a child with Ds, and the examples are few and far between. The fact alone of Sarah having Trig in the public eye, is huge for positive awareness. We see Trig out on the Alaskan nature trails with his family, lounging and playing in the backyard with his siblings, cheering on his dad at a snowmobile expedition. He is simply an integral and valued member of the Palin family. And, those smiles on each of the Palin family member’s faces when they are engaged with Trig speak volumes. I know and feel those smiles, because I have the same smile when I’m with Wil. Sarah’s also furthered awareness by writing articles about raising Trig. When I read her words, they all ring true. She writes openly and honestly, speaking of the challenges, but also of the immense joy Trig brings to her family. Whatever you believe about Sarah Palin, these facts alone bring great awareness, and should not be slammed and then defended in the name of politics. As a parent, and an advocate, it just crushes me when I see people’s political opinions devalue what Sarah has done simply by the fact of giving Trig life, and showing the world what a valued part of their family he is. 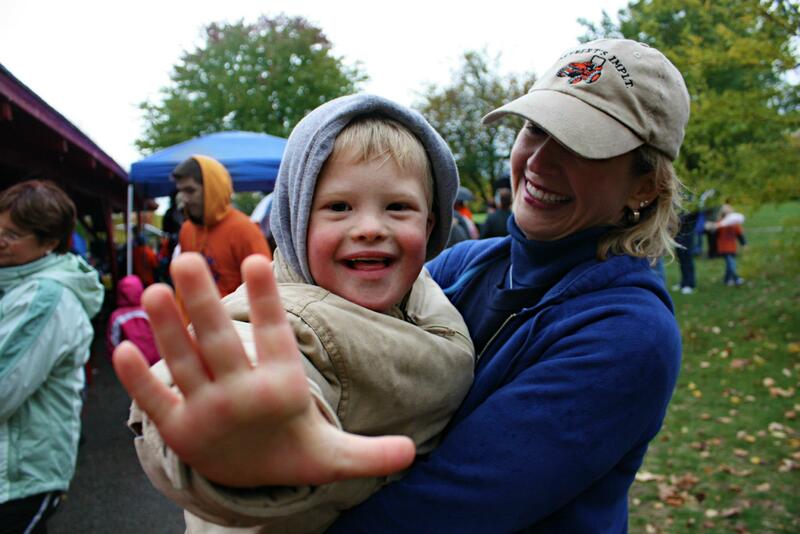 Trig is a shining star, and Sarah is showing the world how brightly he shines upon her family. That example is much needed and should be celebrated, not put down in cowardice. Yesterday, my little guy gave me a scare, and taught me a lesson. 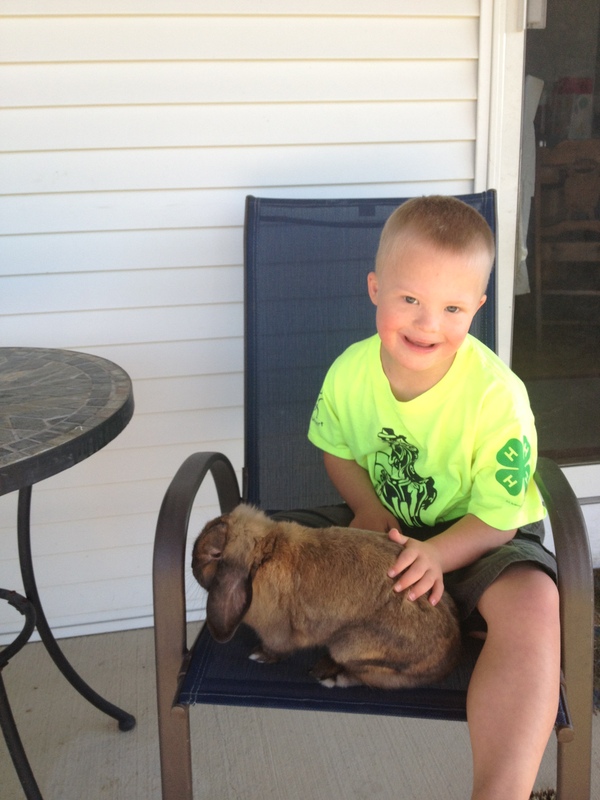 My three children, our little Holland Lop bunny, and I drove up to visit a woman who runs the 4-H program for bunnies. The twins were very excited to see all the bunnies she had and to learn about registering our Lop. As we pull up her long driveway, we see she has a modest home, with a neighboring barn, and plenty of surrounding property. She greets us and walks us through the barn, chock-full of buns in pens. The owner is clearly in her element as she explains the personalities of her many breeds. The twins couldn’t be happier. They have never learned about and seen so many different types of bunnies all in one place. Wil, on the other hand, is having none of it. The barn floor is squishy with wet hay, the lighting is dim and there are loud fans blowing. Wil is not a fan of uneven surfaces, the dark or loud noises. With all this going on, he could care less about the bunnies, all he wants is out. I pick him up and carry him, and try to distract him with some cute baby bunnies, but he’s still not having it. Then, we see a friendly cat waltz through the barn. He wants to pet the cat. So I set him down, and off he goes after the cat. The cat runs out of the barn, and so does Wil. Wil is known to take off, and I know he will go wherever this cat goes, so I run out after him, and holler to the owner and the girls that I am leaving for a moment. It couldn’t have been 30 seconds that Wil was out of my sight, but now he is gone. There is a lot of property, without many trees, so I can see a great distance, yet he is nowhere in sight. I tell myself, stay calm, he can’t be far. I run to the house and peek in the door, calling for Wil. No, they have not seen him. Now, my heart is going a million miles an hour, my voice getting more shrill in calling for Wil, but I am still hanging onto my sanity with the fact that there are no trees and I can see all around me. I run back toward the barn, thinking maybe he ran around the other side. As I do, there in the driveway sitting on the ground by the owner’s pick up truck, is Wil. I hadn’t seen him as I ran out of the barn, because the pick-up blocked my view. Now, coming back toward the barn, I could see he had been right there all the time. My emotions and Wil’s were polar opposites. Wil was joyful and relaxed, playing and petting the cat’s belly. I stood there watching him awash with relief yet my brain and pounding heart struggling to release the seconds before felt panic. I knew he had to have seen me run by calling him, but didn’t say a peep. He knew he’d have to go back in the barn if I found him. I picked him up and gave him a huge hug. His feet did not touch the ground the rest of our stay. 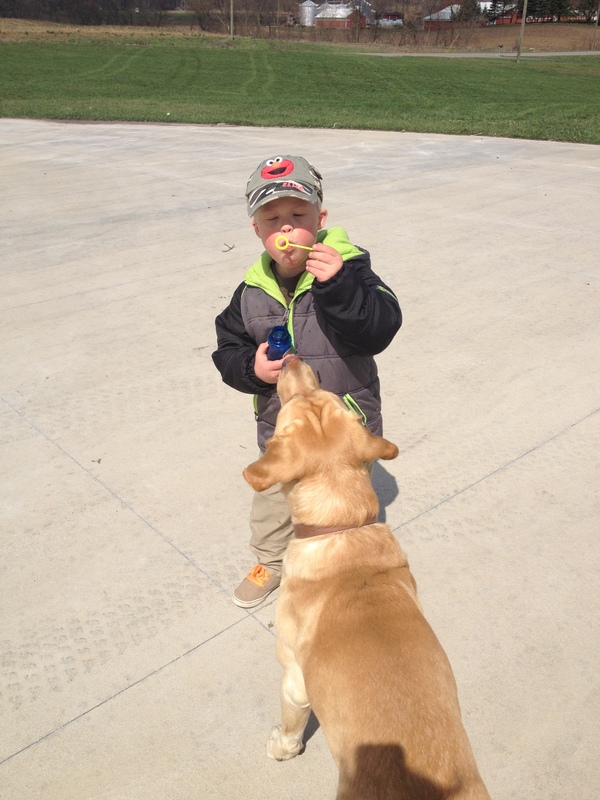 Wil is a smart kid, he knew he wanted out of that barn, and he wanted to play with that cat. He found a way to elude me while staying within only a few feet from the barn. After I had calmed down, I had to admire his tactic. He didn’t go to great lengths to get what he wanted. Using some ingenuity, he obtained what he wanted without going far at all. Wil is full of life lessons. I just wish he didn’t have to scare the heck out of me to be sure I was paying attention! Down syndrome, the “easy” disability? 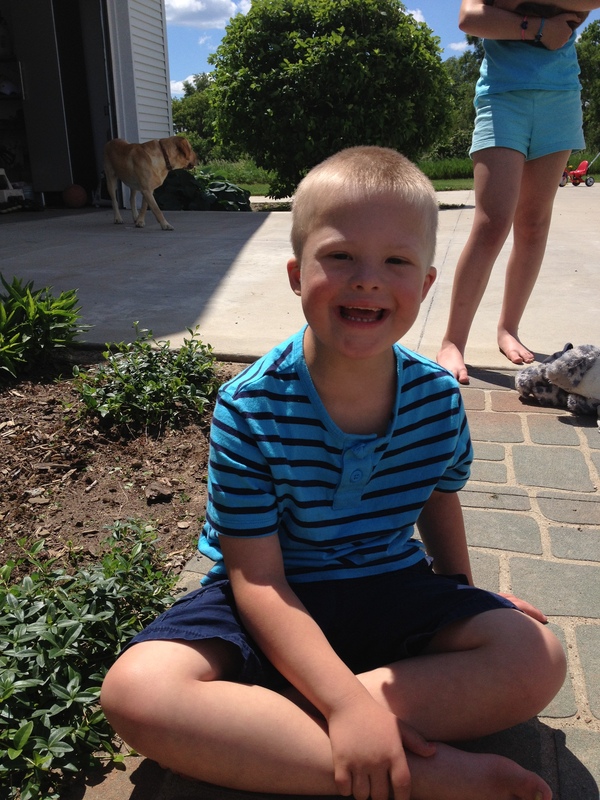 Wil has a loving and personable disposition, therefore, Down syndrome is an easy disability, right? I may have given this impression because I choose to write on the joys of life with Ds. However, every disability comes with its own complexities and challenges. Please allow me give you a glimpse into why I put my focus on Ds where I do. With lack of research and lack of public awareness of the quality of life of Ds, people fear Ds. The extra copy of the 21st chromosome can bring with it health issues and delays, yet Down syndrome is not as greatly researched and medically funded as other widely known disabilities. Sadly, lack of awareness along with new medical strides in pre-natal testing has contributed to greater termination rates where Ds is detected. Obviously, health issues, delays and other challenges are very important topics to be understood and addressed. However, I firmly believe, that if you do not understand the great value of a child’s life with Ds, first and foremost, the aforementioned will add to the fears. There are excellent writers and advocates for medical research and educating medical professionals about the quality of life of people with Ds. With this education, medical professionals can help new parents make informed choices. One of these writers is Brian Skotko http://www.brianskotko.com/. That is his area of expertise, and I am thankful for his advocacy. As I am raising a child with Ds, I have chosen to write and educate on the joys of parenting a child with Ds. That is my passion, and my expertise. When Wil was born, and we were told he had Ds, I had very little knowledge about what that meant. If someone had thrown all of the medical jargon about Ds at me, and focused on the health risks and delays, that would have only contributed to my fears. Instead, the afternoon of the day Wil was born, a social worker walked in to my hospital room carrying a blue folder. I knew that folder was full of info about Ds, and she was going to be the “helpful” social worker by going through all of it with me. I immediately didn’t like this woman and her blue folder. Wasn’t being told your child had Down syndrome enough to process for one day? On the cover of this folder, almost taking up the whole of it, was a close-up of a young girl with Ds with large almond-shaped blue eyes. Gone were my thoughts of medical conditions, cognitive and physical delays. All I saw was the bright face of a beautiful child. I will never forget what that kind social worker did for me. She brought my focus away from the condition, and put it on the child, first. After I brought that blue folder home, I took time to go through it. It contained tons of valuable information, and soon became dog-eared from my constant reference to it. However, each time I pulled that folder out, I first saw the bright eyes of the child on the cover. That blue folder turned into a metaphor: Though knowledge is of great importance, the first focus is on the beautiful child. I so love Wil, and the joy he fills me with, that even though challenges are there, this love is what gives me strength to handle them. I share these joys with you, so you may see the quality of my son’s life, despite his challenges, and the strength this love gives to work with the challenges. Maybe in doing so, I have given you the misconception that Ds is an easy disability. Oh, you are worth it and then some, my little buddy. Beginning each day vibrant, refreshed, renewed. Strength derived from spring rains, the earth, its compost. Taking in the pleasures of all it is given. Fun kids ABC Video…check it out! Hi All! This adorable ABC video was recently shared with me by FunStation4Kidz. My kids love it, and so do I…so, now, I share it with you 🙂 Enjoy!! Even my beloved morning coffee can’t touch the natural high that happy, little voice lifts me up with in the AM. Wil is prone to croup in the winter and spring, yet even after a night of that deep, gasping for air cough, that frightens the heck out of both of us, when morning comes, he still wakes with a smile, ready to take on the day. Oh, but don’t let me give you the wrong impression that happiness is the only fuel in Wil’s personality gauge. He experiences a complete range of emotions. If he is tired and frustrated at school, he will absolutely refuse to do a lesson. He won’t think twice about crawling under a table or plopping himself on the floor, and refuse to move. His stubborn streak is quite impressive, indeed. However, if he is having a stubborn or angry moment, he feels his emotions, expresses them, and then moves on to the next thing. He doesn’t hold on to the anger or frustration and let it affect the rest of his day. The other day, I couldn’t get Wil’s bubble machine to work. He was very impatient and upset with me for not working my mommy magic to fix his prized toy. Try as I might, it was a goner. Wil was mad and I was unable to distract him with another toy. He was set on the bubble machine. After many failed attempts at distracting him, I said, “Sorry, buddy, you just need to find something else to do” and left him to his own devices. He sulked for a bit, and then, he walked to the garden hose, turned it on, and started to squirt and play with our labrador, Woody. Within moments, Woody was jumping all around chasing the water, and Wil was giggling like crazy. Bubble machine? What bubble machine? Wil loves that bubble machine, and I know he will not forget about it. But, he didn’t let the fact that he couldn’t play with it ruin the rest of his day. He got mad, mourned the loss of it, then found another way to bring some joy into his day. I know, even if Wil goes to bed missing his bubble machine, he will still wake up happy in anticipation of a new day, and new ways to find happiness.